Ffynnon Ddeuno stood on the Gatewen Estate near Broughton until it vanished from view under the spoil heap from a nearby coalmine. The name of the well, or at least its spelling, varies to some degree. The RCAHMW database records it as Ddeuno as does Francis Jones, other records spell the name as Deuno. In 1699 Lhuyd reported it as Ffynnon Dheyno, suggesting that at one time a small chapel was said to have stood over it. Jones cites the Deeds of Gatewen 1738-1823 in which the farm is named Ffynnon Beuno, alias Capel Beuno; suggesting that the name Deuno may have been derived from Beuno through the Welsh habit of switching aspirants in relation to grammar. If the well was indeed to have been a Saint’s well then Baring-Gould’s Lives of British Saints does not record a St Ddeuno. The well originally stood on the Gatewen Farm lands which were incorporated into the Gatewen Hall estate in the early 19th century by Thomas Hayes, who substantially enlarged the Hall and estate on the back of income received from the slave trade. the Hayes family having occupied Gatewen Hall since the 18th century. The well was “rediscovered” in the 1870s by the Misses Hayes, daughters of then Hayes family owners. They restored it by constructing a new building over it, forming an arched roof with bench seats along either side of the well. Ivy and other trailing plants where grown over it. Unfortunately, around the same time further coal seas were discovered in the area and the Gatewen colliery opened in 1877. The mine grew such that by 1908 the mine employed 800 men and by the 1920s over 1000 men. The pit eventually closed in 1932. 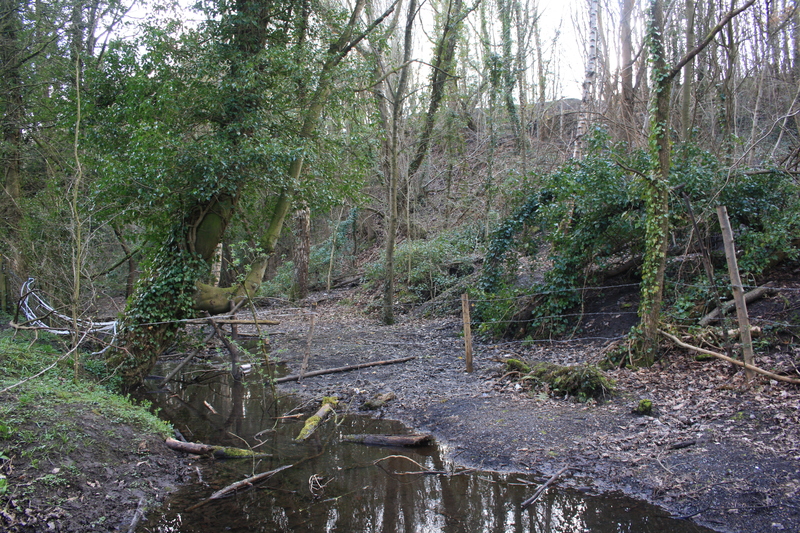 However, the spoil heap from the colliery gradually encroached upon the area where the well lay. Local historian A N Palmer  saw the well in the early twentieth century, reporting that the building “though modern and unpretentious is very picturesque, still stood, although the well had by that time run dry, and eventually, at some point soon after both the well and the Misses Hayes structure vanished under earth extracted from the mine. The best records of memories of the well are included on the very informative website of the Broughton Local History Society  , which has been drawn upon for the preparation of this entry. They quote from the notes of Thomas Morgan (1878-1965), who lived all his life in the area. 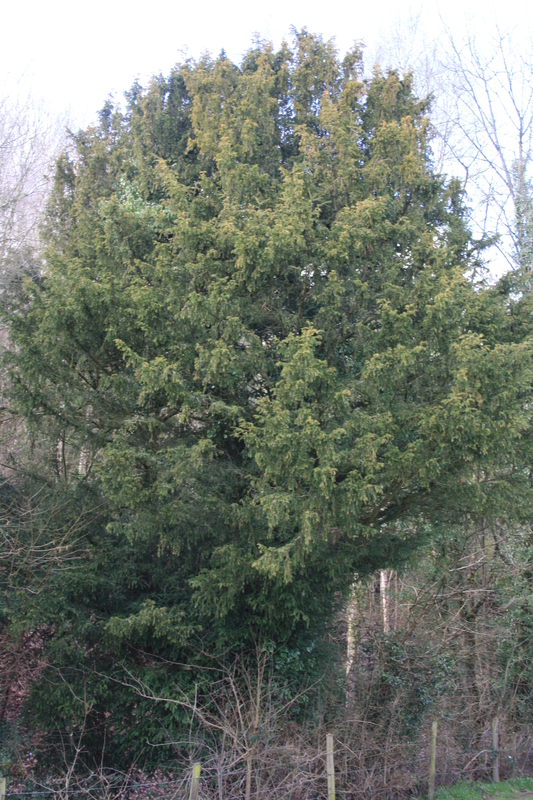 A single yew tree remains today, between the brook and the path; but looking across towards where the well must have stood all one sees now is the steeply rising, now tree lined slopes of the last remnants of Gatewen colliery. The top of the heap is levelled off, and new housing estates are spreading across the old Gatewen farm lands. I dont think your looking in the right place !, the well is closer to Broughton hall !! please keep me posted of any more details as its really interesting. Interesting. I must go back for another look – any hints as to where it might be. 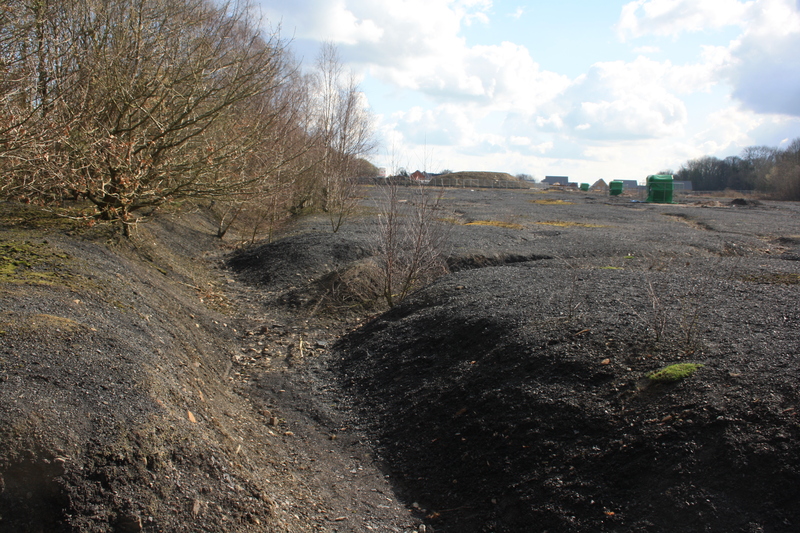 The reports I read seemed to imply that it had been totally obliterated by the coal spoil heaps. It would be good if it really were the well and could be uncovered. So many of these wells lie neglected, and those that are not lost now soon will be. I have an old copy of Alfred Palmer’s book ‘The History of the Thirteen Country Townships of Wrexham’. When I acquired it, it was full of old 1930s and 40s newspaper clippings on Wrexham history subjects, and had a lot of corrections, and annotations, added by a previous owner who appears (by their comments on some of the family trees) to have been a descendant of one of the old landowning families mentioned in the book. Anyway, the point of this story is that alongside Palmer’s entry on Ffynnon Deuno, the annotator has written “in the old estate deeds [the well] is called Ffynnon Beuno”. I have never seen the Gatewen deeds myself, and unfortunately they do not say exactly how old these deeds are. If they predated Lhuyd’s “ffynnon dheyno” it would be an interesting bit of evidence. I think Beuno is the logical name for the well – almost certainly a mishearing of recording from somewhere – Deuno doesn’t make any sense for many reasons, any documentation supporting that helps whether or not it predates Lhuyd ( might the Gatewen deeds do that? ) I’m sure his spelling and that of his informants is pretty erratic anyway. That’s the joy of getting second hand books, you never know who they might once have belonged to and what else you might find inside. Alternatively, it may just be evidence that I have Francis Jones’ old copy of Palmer!